Valentine’s Day is the second-most popular holiday for retail sales, falling behind only Christmas. Valentine’s Day is the one special day of the year that everyone is expressing their love, all on the same day, to the most precious people in their lives. Beauty salon, hair salon, or spa services are perfect gifts - when planned and promoted right - the additional dollars will make you fall in love with February. 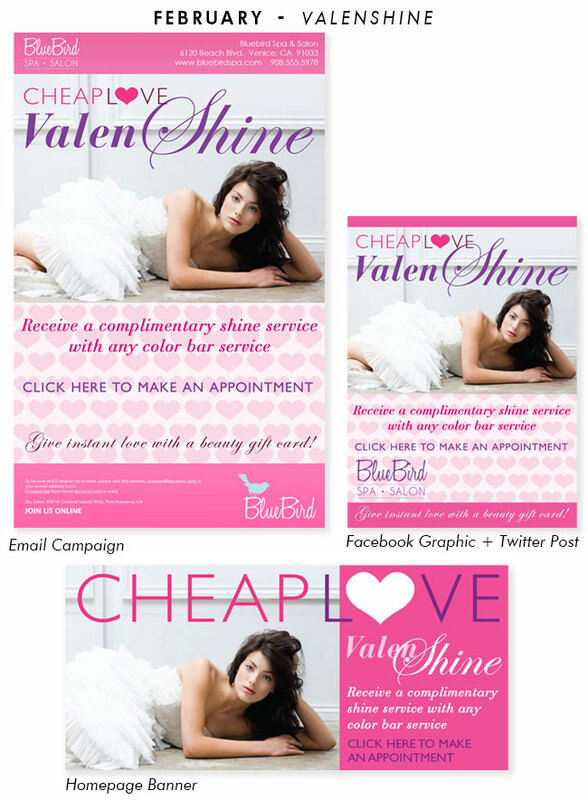 Don’t limit your Valentine's Day promotions to only your salon “retail area” or space. There are plenty of additional places in the salon to promote products and services. Determine a "Valentines Look" for your salon or spa. Decorate to add some love to your business in your special branded way. Your salon windows are your most valuable advertising space. Valentine's Day merchandising should be prominently showcased in the display window that faces the street. Don’t underestimate the power of talking to the street. Pick a theme, be bold. Then choose decorations and retail products that tell a story. Theme everything to your story – from your color to your merchandise. Valentine’s Day is about treating someone. In addition to offering gift certificates for dollar amounts, consider putting together special combination packages. When people receive a gift certificate for a dollar amount, they tend to use it for services they normally receive at the salon. Instead, put together beauty and pamper packages that make the recipient feel treated. This strategy works for female and male gifts - in addition to packages for women offer grooming packages that a boyfriend or husband will enjoy. Tip: It is more profitable to sell “luxury service" packages to expose clients to new services they have never tried, and could continue. Packages are also a great opportunity to sell service combinations, each service added to a package increases the value to the client. Put together hair care products to sell as gifts. Just think about who is buying the bundle, and whom they are buying it for. Don't put customers off by offering complicated bundles. Keep it simple. When offering product bundles, display and create attractive packages that are “ready-to-gift”. Make product bundles more attractive by pre-packaging them in simple open-top gift boxes, gift bags, pink and red tissue, and beautiful ribbon. Offering a monetary value to redeem against your services is a fantastic option for indecisive customers. If you are providing gift cards make sure it includes an attractive gift card presentation that is professionally designed and printed. This should reflect your salon brand, be contemporary and high quality. For larger gift card purchases a branded box is even more fitting, it is much more exciting to discover a gift card nestling inside a pretty box then just a dreary certificate printed on cheap paper. So many hair and beauty salons present cheap-looking gift cards which proudly boast $75 on them. If a guest is spending $75 + on a present - it needs to look and feel special! Hair straighteners, dryers and other electrical goods make great gifts. Make sure you put pretty pink or red ribbon around stocked boxed goods - they move faster and are immediately perceived as gift ideas. Work with appropriate local business connections, like restaurants or florists, to come up with joint Valentine's Day offers. This strategy requires more coordinating, but when done right can make your promotion stand out. Decided your offers? Now it's time to promote across all channels to get as much exposure as possible. The premise is a simple one; the more people that are aware of your package, the more you are going sell. To take full advantage of the Valentine's Day holiday begin promoting 4 weeks before the 14th (January 14th at the earliest). Online salon or spa gift cards are the perfect solution for last-minute Valentine’s Day shoppers. The most popular time for Valentine's gift card sales is Valentine's Day “eve”? By offering gift cards online, your business can rescue procrastinators up to February 14. Panicked gift givers can access your salon’s website and purchase a thoughtful gift, making instant gift cards a money-making opportunity. Up to 25% of all the gift cards are purchased at the last minute. Gift card promotions give salon owners the opportunity to turn a “gift card guest” into a repeat and loyal client. A solid first impression with their Valentine’s Day experience will make them more likely to return. 1. Ask each gift card guest to fill out a client card to allow future correspondence. 2. Treat each gift card guest like a VIP. 3. Re-book gift card guest for a follow-up service at end of experience. Need a Valentine's Day promotion and haven't planned it out yet? Let BeautyMark help maximize your Valentine’s Day returns. Start promoting your Valentine's Day offers with gorgeous and professional design. 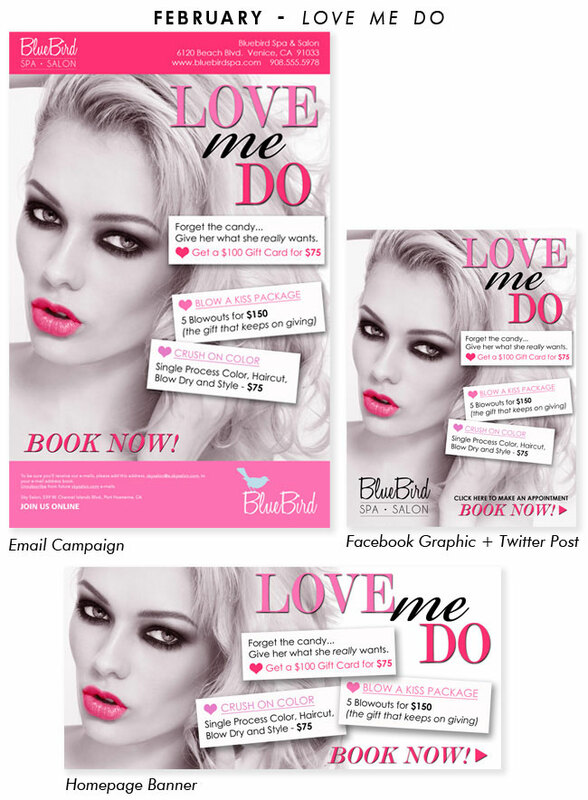 Check out BeautyMark's pre-made email campaigns, social media graphic posts and website banners. Don't miss out on another revenue-generating holiday opportunity. Visit here to learn more about our pre-made Valentine's Day promotions.